(NaturalNews) As Natural News has reported in the past, there has been a tragic side effect tied to more than a decade of combat in Iraq and Afghanistan on the U.S. military, and that is the increased instance of suicide. It took the military a while to figure out it had a problem, but once it became apparent, the services launched a number of initiatives aimed at figuring out why so many of America's military men and women are taking their own lives once they rotate back home. In the past, it was thought that successive combat deployments were primarily responsible for the increased number of suicides; the need to keep sizeable forces in two separate theaters of operation meant a high operational tempo, forcing the same units to return to war zones frequently. And with America's all-volunteer force, that meant many of the same soldiers, Marines, sailors and airmen were deployed multiple times. But a new study conducted in conjunction with the Veterans Affairs Puget Sound Health Care System in Seattle found mental disorders, which include alcoholism and depression, were linked to increased risks of suicide among current and former military personnel, while combat exposure and the number of times personnel were deployed were not. No link seen between combat, deployments and suicide? Researchers said the analysis of 83 suicides between 2001 and 2008 does not support the assumption that experiences in combat - such as seeing dead bodies or firing a gun - and time spent in a war zone are directly tied to a higher suicide risk. "It was suspected of course that the stresses of combat exposure would lead to bad outcomes such as suicide," Dr. Edward Boyko, of the VA Puget Sound Health Care System, who worked on the study, told Reuters Health. "We suspected that there would be an association between combat and suicide, given that there's been a reported increase in suicide rates." The study included 151,560 veterans and currently serving personnel who were assessed in three separate waves, beginning in 2001, the year of al Qaeda's 9/11 attack. Every three years thereafter, study participants took a survey which asked them about their experiences in combat. The assessments included questions about depression, manic-depressive disorder and alcohol abuse and misuse. Researchers led by Cynthia LeardMann from the Naval Health Research Center in San Diego used Department of Defense personnel files to determine how many times and for how long each person was deployed. Through 2008, 646 of the study participants had died, including 83 by suicide. According to the data, researchers could find no difference between the risk of suicide among personnel who had been deployed and those who had not. Also, more cumulative days deployed was not tied to a peak in suicide risk. In fact, researchers found that suicides were about as common among study participants of differing military service branches, occupations and ranks. But, the study team wrote in the Journal of the American Medical Association, male service members were twice as likely to commit suicide as women, an occurrence that is duplicable in the civilian world as well. "I don't think (the results) are surprising, in the broader sense," Michael Anestis, a clinical psychologist from the University of Southern Mississippi who has studied suicide in the military, told Reuters Health. "They're saying that the risk factors in soldiers are not that dissimilar to the risk factors in civilians." 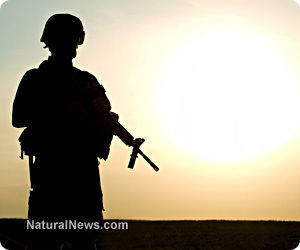 Earlier we reported that data suggested a dramatic increase in military suicides was linked to multiple concussions suffered by troops involved in successive roadside bombings and other combat actions in Iraq and Afghanistan [http://www.naturalnews.com]. But we quantified that by noting previous data at least hinted that other causes - pharmaceutical drug use including anti-depressants - could have played a much larger role than was realized. "All of a sudden the likelihood of being suicidal increased dramatically once you had the second head injury," Craig Bryan, who was an Air Force psychologist in Iraq in 2009, said of a study he conducted regarding TBI - traumatic brain injury - and the incidence of suicide. But, as The Associated Press reported in 2011, too much combat exposure and an increase in post-traumatic stress has also led to "misuse of prescription medications and personal financial problems." Many of those prescription medications are dangerous anti-depressants, noted for causing the exact opposite effect of what they were intended to do.